The Premier Oil Palm Event is back! KSB Malaysia never missed to participate this event every 2 years since Yr 2011. 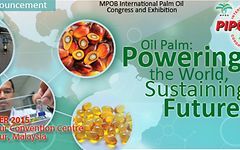 MPOB (Malaysian Palm Oil Board), the organizer set the theme Powering the world, sustaining the future. The Grand MPOB International Palm Oil Congress and Exhibition (PIPOC) with five concurrent conference will examine and discuss the many facets of the oil palm industry. The event will be held on 6th - 8th Oct 2015 at Kuala Lumpur Convention Center (KLCC). Come and visit us at booth no: 127 & 138. At this year’s IFAT, KSB Aktiengesellschaft, Frankenthal, Germany, will present an innovative solids separation system allowing highly efficient waste water disposal in pumped drainage applications..
At this year’s ACHEMA (18 to 22 June 2012) in Frankfurt, the KSB Group, Frankenthal, Germany, will debut the latest generation of its standardised chemical pumps. In spring 2012, Frankenthal-based KSB Aktiengesellschaft will introduce to the market a new generation of its waste water lifting units. Its modern design, i.e. a triangle-shaped mini tank, and the low height make Ama-Drainer-Box Mini not only a visual highlight but also a space-saving and stable solution. KSB at IFAT 2012 / “Water Extraction"
Along with a number of other water extraction pumps, KSB Aktiengesellschaft, Frankenthal, Germany, will be presenting a typical UPA 250C submersible borehole pump at this year's IFAT held from 7 to 11 May. At this year’s ACHEMA, KSB Aktiengesellschaft, Frankenthal, will for the first time present immersion pumps type Movitec VCl. As a complement to its extensive range of butterfly valves for handling liquefied gas, KSB Aktiengesellschaft, Frankenthal, Germany will be presenting the new TRIODIS valve series at this year’s ACHEMA. KSB Aktiengesellschaft based in Frankenthal, Germany, is set to supply four 52-tonne waste water pumps for the construction of the Lee Tunnel in London. At this year's Hannover Messe trade fair (23-27 April 2012), Frankenthal-based pump and valve manufacturer KSB featured the SuPremE motor as their stand's main attraction. March 2014 saw KSB Aktiengesellschaft, Frankenthal, Germany, win a contract to supply 189 process pumps for the new Nghi Son refinery in Vietnam.